Except for ‘Appleblossom’, the galaxy hybrids produce well and have good postharvest characteristics. Belongs to the Compositae (aster) family. Related species include sunflower, chrysanthemum, lettuce and zinnia. Tiny flowers in flat-topped clusters occur at stem ends. Stems have feathery leaves, 18-24 inches long. Plant is a herbaceous perennial, dicotyledon, leaves not parallel veined. 36-41 F, up to 3 days. Named after Achilles, who used the plant medicinally to heal his wounded soldiers. 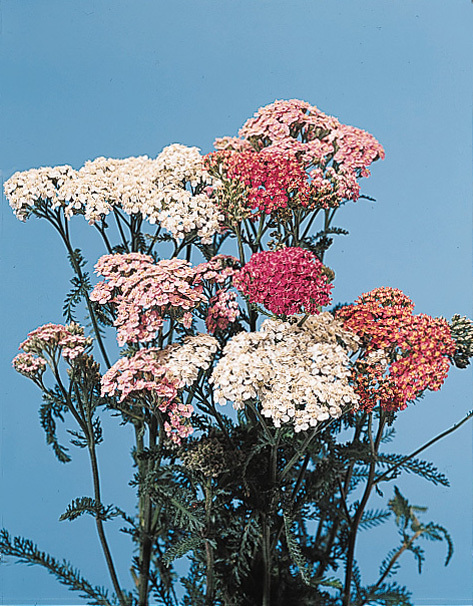 Yarrow stems were used by both the Druids and the Chinese to foretell the future. One yarrow leaf is said to speed decomposition of a wheelbarrow full of raw compost. Many garden species exist, both tall growing and groundcover types. Can become weeds because they grow so fast. Harvest when flowers are fully open. Species used for cut flowers include A. filipendulina (yellow), A. millefolium (many colors), A. ptarmica (white), A. ‘Coronation Gold’ (yellow). The Compositae or aster family is vast, with over 20,000 species, and is also one of the most developed families. It was named Compositae because the flowers are actually a “composite” of many individual flowers into one head. Hence, when children pull one “petal” off at a time, saying “she/he loves me, loves me not”, they are actually removing a complete flower, not just a petal.